The story behind the hair at Marc Jacobs’s show today involves fashion’s most legendary hair stylist, Guido Palau, and an Etsy seller named Jen. Let’s examine it by the numbers. Three: The number of months ago that Marc Jacobs was first inspired by the multicolor textured dreadlocks of director, trans woman, and spring/summer 2016 campaign star Lana Wachowski. In July, he messaged a picture of Wachowski to Palau, who then spent weeks searching online for a purveyor who could provide hair in a rainbow of shades. The next number: 300. Palau and Jen and the hair team worked with Jacobs to dye 300 different shades that would coordinate with the collection. “He was like, ‘I want to see this shade and this shade and this shade!’ His coloration and detailing was incredible. He would say, ‘Could you do something in a more khaki shade?’ Every coloration was so important,” Palau said. Coming to New York a week before the show, Jen and her daughter holed up in an apartment and hand-dyed over 12,500 yards of yarn. 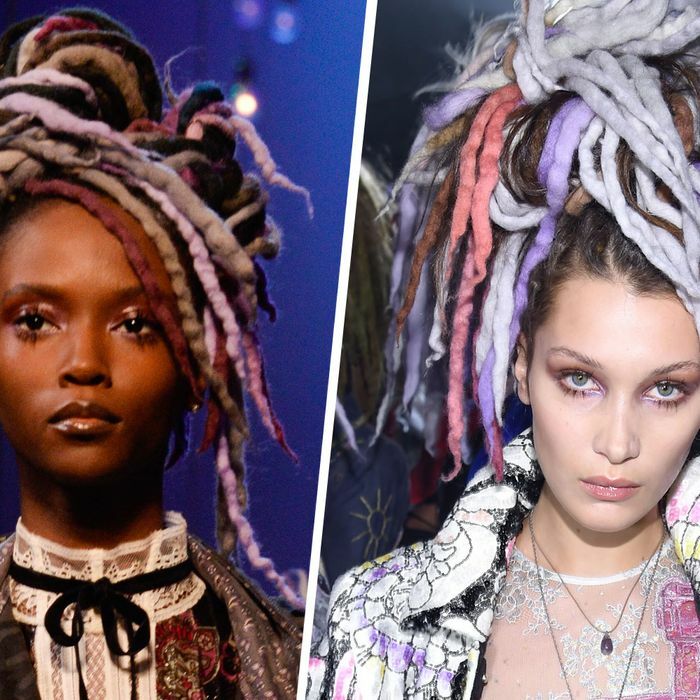 Fifty-five dreads sat atop the heads of Gigi Hadid, Kendall Jenner, Bella Hadid, Adriana Lima, Irina Shayk, Jourdan Dunn, and Karlie Kloss along with the other models in today’s show. Each dread was a different color, but they were all grouped with other complementary hues and gathered into an asymmetric ponytail that rode high on the head, with the tails spilling along the sides of the face. (Palau used Redken Windblown to texturize). There were roughly six or so different color groupings, like a pale-white blonde, pastel pink, and blue cluster; a My Little Pony–like color bouquet with lavender, coral, and royal blue; and a darker grouping with mustard, army green, and sapphire. To complement the hair, François Nars created six different sheer, glossy eye looks in pink, purple, silver, green, blue, and copper using shades like NARS Desdemona Dual-Intensity Eyeshadow, NARS Lysithea Dual Intensity Eyeshadow, and Interstellar Eye Paint. Lips had just gloss (NARS Triple X Lip Gloss), and the eyes were further accented with brown mascara (“for softness,” Nars explained). Small clusters of false eyelashes were placed along the top and lower lash line to open up the eye and give the model the slightest suggestion of dolly lashes. To complement the pastels and sheer washes of color, manicurist Jin Soon Choi painted the models’ nails in one of seven pearlescent pastel shades of Marc Jacobs Beauty nail polish. The shades were created specially for the show and available afterward in a presale.